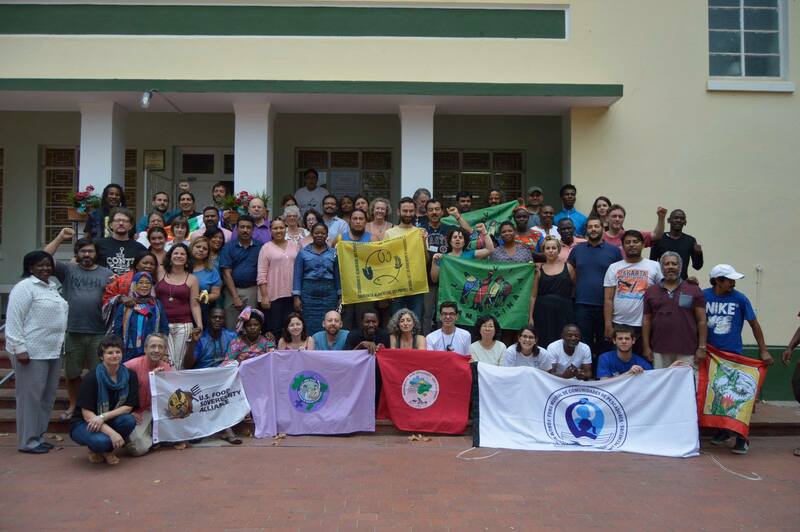 The 40 participants representing farmers, indigenous, women and pastoralist organizations of the Regional Consultation of Latin America and the Caribbean on the Implementation of Farmers’ Rights coming from 13 countries of Latin America and the Caribbean, meeting in Seberí, Río Grande do Sul, Brazil, between 17 and 20 of April, 2018 celebrated the opportunity to meet each other to continue weaving alliances, links and exchanges, strengthening our commitment to defend the seeds for Food Sovereignty. During four days we bear out, once again, the fundamental role that peoples of Latin America and the Caribbean had as a center of origin of biodiversity and culture, from which large part of the seeds that feed humanity today have risen. Corn, sacred to the peoples of Mesoamerica, tomatoes and potatoes are just some of the crops that our ancestors raised, domesticated and bequeathed to the Peoples of the world for their nourishment. It is clear to us that agricultural biodiversity could not have been generated without the immense cultural diversity that, from Alaska to Tierra del Fuego, developed for thousands of years and today is still alive in the strength of the indigenous peoples that despite 500 years of genocide, dispossession and persecution enlighten the flame of hope for the future of all the peoples of the world. However, at present time, the imposition of agro-industrial systems, extractive projects, megaprojects of infrastructures and criminalization of indigenous peoples, are threatening the possibility for most of the Latin American and Caribbean populations of subsisting in their territories and are also devastating biodiversity in all regions. Therefore, not only our peoples are threatened, but also the climate, the possibility of feeding all humanity and all the balances that they achieve, as all the diagnoses reveal, life on the planet as known so far is threatened. In recent years, our struggles have been enlightened by the activism of women in all areas of social construction, questioning the violence and the patriarchal system present in all spheres of our lives. 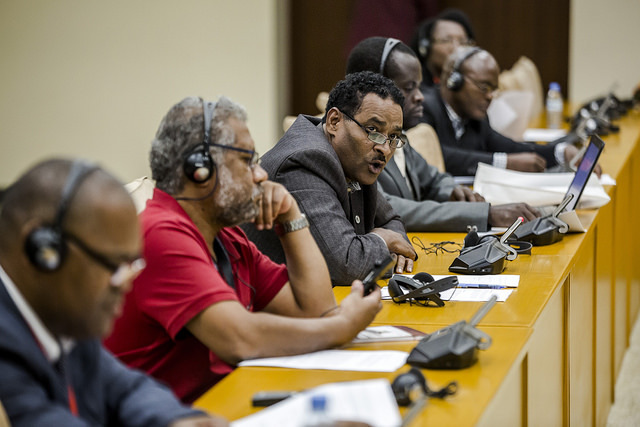 Men and women question on these issues and, through the construction of different links, we propose the transformations of our family, community, regional and international links, in equity, respect and cooperation relations. In this sense, highlighting the need for these changes to also be reflected in the language, we propose and use throughout the document the expression “farmers and farmers” (female/male) instead of “farmer”. It is important to stress that when we talk about “peoples” in this document, we refer to indigenouss, indigenous people, peasants, Afro-descendant communities, artisanal fishermen and fisherwomen, gatherers, shepherds, women and all the local communities that with their work produce food and contribute in maintaining agricultural diversity. We also want to emphasize that during the last two decades Latin America has contributed to a new vision regarding nature by building a new paradigm around it that implies its recognition as a subject of laws. Principles, legislation (even at the constitutional level as in the case of Ecuador) and struggles contribute today in developing new visions about this new concept all around the world. Considering seeds as part of nature and knowing that human beings are also parts of nature, we recognize seeds as subjects of law and we commit ourselves to defend them as such. We reiterate our refusal to use in any circumstances of the Genetic Use Restriction Technologies (so called “Terminator” seeds) that are considered in the moratorium of the Convention on Biological Diversity and we expect its definitive prohibition. We require that the Farmers Rights recognize, protect and promote the agroecological practices according to family and peoples production systems. This means that States should strive not to impose a single model of production and marketing, but rather to allow farmers to sell their own seeds under local market conditions. Finally, we reiterate that our commitment in defense of seeds is part of the achievement of Food Sovereignty through agroecology, convinced that peoples can feed all humanity (as they are already doing it) ending with the shameful scourge of hunger and continuing, as we have done for thousands of years, with a production in harmony with nature. 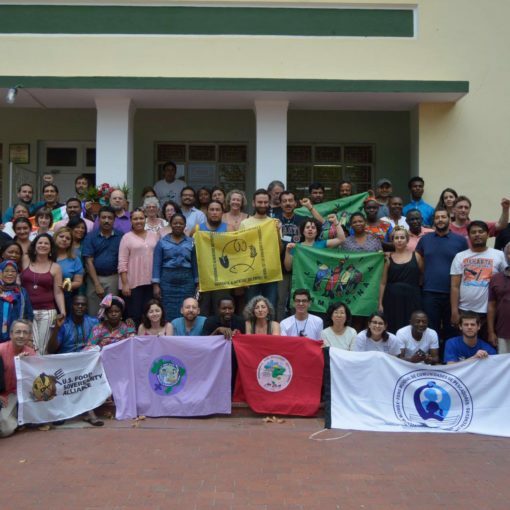 The Regional Consultation of Latin America and the Caribbean on the Implementation of Farmers’ Rights (hereinafter referred to as “Consultation”) recognizes seeds as the heritage of peoples at the service of humanity and as Collective Rights. Therefore, it expresses that they cannot be subject to any type of intellectual property (whether they are breeder’s rights or patents). Asserting that women have been and still are crucial in the creation of agricultural biodiversity, the Consultation proposes that their role must be recognized in all participatory and decision-making boards and, therefore, the Consultation invites governments to include the gender issue at the time of the implementation of Article 9 of the ITPGRFA in its national processes. Another principle is the recognition of the Peoples vision on the seeds as a subject of law and within the rights of nature, having to respect their territoriality and the control of their territories and their biodiversity. Another basic principle for the Consultation is the need to assess the Free, Prior and Informed Consent (FPIC), before any initiative that may affect agricultural biodiversity, knowledge, autonomy and territories of local communities and indigenous peoples. 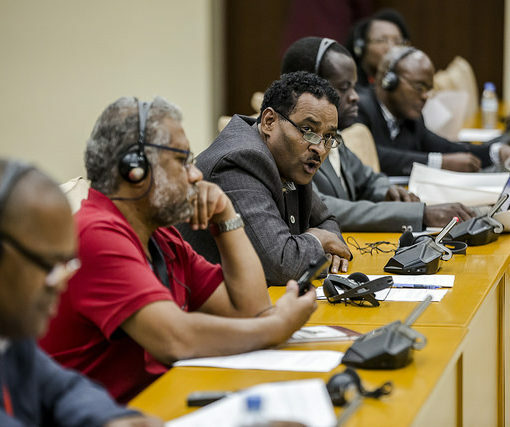 It is clear that FPIC is a right that must be exercised in a legitimate, transparent, effective way that respects local practices and that includes the possibility that the result of FPIC is the denial of external initiatives. No governmental measure should limit the proper forms of organization and the farmers’ rights to rescue, protect, multiply, improve, select, conserve, use, exchange and sell (between Peoples and their organizations) their own seeds. The traditional and ancestral systems of indigenous and creole seed management should not be considered as “informal systems”, but they are customary rights and represent the main systems for the creation of agricultural biodiversity. 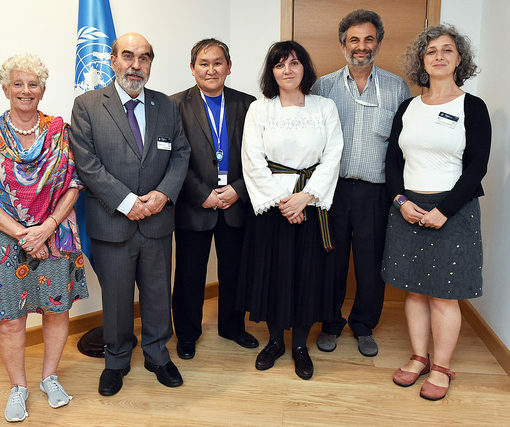 Since FAO affirms that 75% of the agricultural biodiversity has been lost in the last 60 years due to industrial agriculture, the Consultation proposes the rejection of the industrial agriculture that includes the transgenic seeds and the massive use of agro-toxics. We also reject the new breeding manipulated techniques proposed by the corporations, which include the new transgenic, synthetic biology, gene editing (CRISP-R), “terminators” seeds and the genetic dematerialization of seeds, because they represent a threat to the application of the Farmers’ Rights and do not comply with the sustainable use of Article 6 of the ITPGRFA. 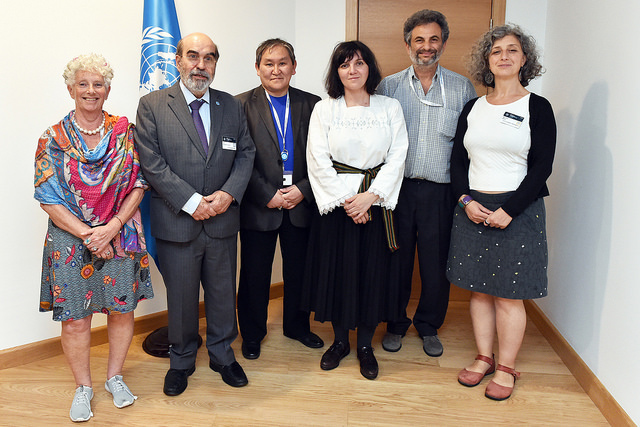 The Consultation considers to be very important the support of the Treaty in the approval of the Declaration of Peasants’ Rights and other Persons Working in the Field and in Rural Areas for the implementation of the Rights of Farmers, which will be dealt with in the United Nations soon. 1. Seeds’ varieties. It is demanded the recognition that all the seeds that are used have origin from the indigenous and peasants’ seeds with which the Peoples co-evolved in the last 10 thousand years approximately. The commercial, industrial and uniform varieties that exist also come from indigenous and peasants’ seeds. 2. Intellectual property rights. In order to implement Farmers’ Rights to rescue, protect, multiply, improve, select, conserve, use, exchange and sell (among Peoples and their organizations) their own seeds, governments should review and update seed laws , patents and other intellectual property systems. a. Rethink the way in which intellectual property rights have been granted over commercial varieties in accordance with the provisions of point 1. 3. Farmers’ rights. It is required to recognize the role of the farmers as a subject of law in national states and their contributions to development and maintenance of agricultural biodiversity and food sovereignty of the people. a. The peasant and indigenous organizations must participate in the construction of laws implementing Farmers’ Rights at national level. b. There should be no territorial and temporary limits in the exercise of Farmers Rights. c. Farmers cannot be criminalized for exercising Farmers Rights. d. The Treaty should establish a monitoring mechanism on the implementation of the Farmers’ Rights, including farmers’ organizations. e. The genetic contamination of indigenous and peasants seeds by transgenic and new technologies is a threat that must be recognized by the Treaty and sanctioned by the States. i. If these threats materialize, reparation is guaranteed to the communities through the CPLI. f. The States must recognize and respect the ancestral knowledge of the Peoples and not apply any policy to the detriment of the same. c. the information of the investigations that are made or that have been made, are returned to the communities and can only be used by them. The inventory of the community must be recognized by the State as part of the right to self-determination. 5. Benefit Sharing Fund. The fund must be fed by the contributions of companies that commercialize commercial, industrial and uniform seeds. a. The payment of the companies must be compulsory. b. To ensure the implementation of Farmers Rights, it is necessary the participation of peasant and indigenous organizations in the management of the fund. c. The destination of the fund should be directed only to farmers’ organizations to strengthen their own programs of conservation and multiplication of agricultural biodiversity (for example: community seed banks, participatory plant breeding, characterization, seed fairs, emergencies, agro-ecological practices, diversification of farm, etc.). 6. Phytosanitary regulations. The phytosanitary norms must not affect the exercise of Farmers Rights. a. Recognize participatory local systems of quality assurance of communities. 7. Participation. The Consultation requires the governments to be transparent in the information and to create participatory spaces for FPIC with the organizations of farmers in the discussion and decision making of policies on seeds. Translation note: this part is coherent only in the Spanish and French version that differentiate farmer male from farmer female. Already recognized by other international treaties such as Article 8j. of the Convention on Biological Diversity, ILO Convention No. 169 on Indigenous and Tribal Peoples in Independent Countries, United Nations Declaration on the Rights of Indigenous Peoples and Voluntary Guidelines on the Responsible Governance of Land Tenure, Fisheries and forests in the context of national food security.